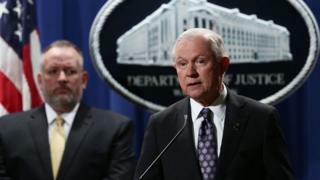 US Attorney General Jeff Sessions has been accused of racism after praising "the Anglo-American heritage" of US policing. A prominent civil rights group and a US senator accused America's top prosecutor of "dog whistle" politics. But a Justice Department spokesman said a Google search reveals it to be a common legal term. Mr Sessions, a former Alabama senator, has previously rejected suggestions he harbours racist sentiments. His remarks on Monday to the National Sheriffs' Association in Washington prompted a swift backlash. Who is US Attorney General Jeff Sessions? Bernice King - the daughter of civil rights icon Martin Luther King Jr - quoted a letter her mother had written in 1986 opposing Mr Sessions' failed appointment to become a federal judge. The NAACP, one of the nation's largest civil rights groups, said: "His decision to link the term Sheriff to some part 'of the Anglo-American heritage of law enforcement,' is an unfortunate yet consistent aspect of the language coming out of the Department of Justice under his tenure and in the opinion of the NAACP, qualifies as the latest example of dog whistle politics." Mr Sessions' speech transcript, which was released to the media ahead of his remarks, did not contain the phrase "Anglo-American heritage". 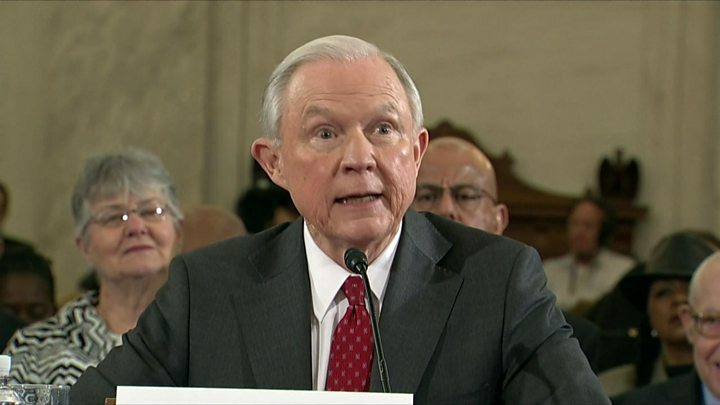 Media captionAt his confirmation hearing last year, Jeff Sessions said the caricature of him as a Southern racist was "painful"
He had been expected to say: "The sheriff is a critical part of our legal heritage." Instead he said: "The sheriff is a critical part of the Anglo-American heritage of law enforcement." Actress Alyssa Milano called for Mr Sessions to be "fired immediately". Rapper Talib Kweli tweeted that the attorney general "took his klan hood all the way off" in a reference to the Ku Klux Klan. But some pointed out that Mr Sessions may have been referring to the system of common law that originated in England. Several Supreme Court decisions have referenced the phrase, including opinions written by both conservative and liberal judges. The word "sheriff" is derived from an Old English term dating as far back as 1034, before the Norman Conquest, according to Oxford English Dictionary. "As most law students learn in the first week of their first year, Anglo-American law - also known as the common law - is a shared legal heritage between England and America," Ian Prior, a spokesman for the Justice Department, said in a statement. The end of the Anglo-American order? "The sheriff is unique to that shared legal heritage. Before reporters sloppily imply nefarious meaning behind the term, we would suggest that they read any number of the Supreme Court opinions that use the term," he added. "Or they could simply put 'Anglo-American law' into Google."